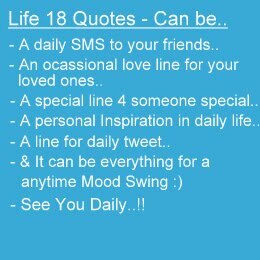 Who is Behind the Life 18..
Hi, My name is HB & i am the OWNER of "THE LIFE 18 QUOTES "
I'm a freelancer and i love to write and keep inspire my self in everyday life, and i think it reflects over here.. So, It's nothing like Indiana Jones for the digital age.. But it's like from Indiana Jones to the Jones of digital age..!! The blog and the keys I've typed on my keyboard will take you on an Incredible journey of inspiring, aspiring, funny, awesome world of quotes.. and take you to beyond the invisible.